The International Center for Environmental Arts (ICEA) was founded by David and Renate Jakupca in 1987 to meet the compelling needs of ordinary citizens for access to current, balanced, understandable information about complex global issues. ICEA was organized into three divisions: Environmental, Humanities, Arts and Culture, this acts as an umbrella organization of affiliated groups that support related agendas with the idea of creating a prototype NGO that is easily replicable in other communities, cities, states and countries. ICEA's mission is the Theory of ICEALITY on Environmental Arts, that is to "Assist in understanding of the relationship between Humans and their Environment through Arts and culture ultimately promoting a sustainable global Culture of Peace between all Living Things (Human, Plant and Animal Kingdoms)" As the first professional art organization to be solely dedicated to this endeavor, this has made ICEA a leader in the Environmental Arts Movement and a force for socially responsible activity. ICEA participated in the 1992 EARTH SUMMIT, and in 1993, David and Renate were official UN Observers to the UN Conference on Human Rights in Vienna , Austria. There with the approval of the US delegates, Geraldine Ferraro and President Jimmy Carter, ICEA has been promoting iceality and recycling all major UN World Conferences until they were discontinued in 2007. These recycled conferences and related ICEA exhibits have received international critical acclaim in the environmental arts movement. 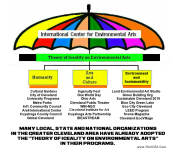 As a visionary providing inspiration for others in the sustainable development of Cleveland, David has been officially designated by The City of Cleveland, Earth Island Institute and other major organizations as the "Spiritual Father of the Environmental Art Movement". TIME Magazine nominated them for their Millennium Heroes for the Planet. 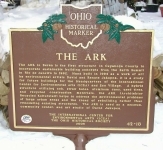 The historic ARK in Berea, home of the sustainable global Environmental Arts Movement, helped inaugurate the green building trend that is now sweeping America. In 2000, mainly because of their heightened talent to match ability with vision, David and Renate were the ideal avant-guides to help lead the Nation into the next Millennium when they spent six months in Europe at EXPO2000, the World's Fair in Hannover, Germany as Americas Cultural Ambassadors. their Environment through the Arts"
FAIR USE NOTICE: This website contains intellectual property and copyrighted material. Such information is made available for educational purposes, to advance understanding of human rights, democracy, scientific, environmental, moral, ethical, and social justice issues, art & culture, etc. This constitutes a ‘fair use’ of any such private material as provided for in Title 17 U.S.C. section 107 of the US Copyright Law and the Digital Millennium Copyright Act of 1998 (DMCA) . In accordance with Title 17 U.S.C. Section 107 and DMCA, the material on this site is distributed without profit to those who have an interest in receiving the included information for personal, research or educational purposes.